Butetown and me have never been more than acquaintances. As a journalism student at Cardiff University back in 2009, I used to walk down Bute Street only to head to the Bay, unaware of what laid behind the terraced houses that decorate the sidewalk: I would glance at the African shops and the colourful murales on the right hand side of the street and assume I knew something about the place. I couldn’t be more wrong about it. I ignored that since the early 18th century Butetown has been the multicultural spot of the city, a place where people from different continents lived in the same Victorian house; nor I knew the first Yemeni and Somalis sailors making landfall to the Bay where also the founder of Britain’s first mosque in 2 Glynrhondda St, Cathays. I knew very few about Butetown up until March 2013 when I visited the Diff again after working in London. This time I was determined to learn more about the area for personal and professional reasons. On the personal side I needed to know more about African culture and migration. Despite being in Italy from Congolese parents I haven’t lived in an African community and so my knowledge of the continent and its cultures was limited to what I read, watched and was told. The hunger for information wedded so well with my professional soul as I started to work on a documentary on migrants from Sub-Saharan Africa. Back in 2011 and throughout 2012 few trips brought me to Oslo, Brussels and Istanbul. And in these cities I couldn’t help but notice the urban isolation of African migrants. In Istanbul, tall, muscled men would appear during the day, selling goods on the Galata bridge over the Golden Horn and disappear when the sun sat down, like invisible presences. After doing some research and discovering how few has been written on these communities, I decided to work on a reportage called “Where we are”, with the aim of discovering and let emerge un(der)reported ethnic groups and cultures, baring two questions: are these groups isolating or isolated? How are people living there? With these queries in mind and the will to avoid the same old representation of migrants, I began working with Gianpaolo Bucci, an Italian filmmaker who quitted his job at RAI, the equivalent of the BBC in Italy, to focus on social issues and human rights. From a reportage confined to few European cities, the project became an ambitious multimedia documentary to be shot in 12 different cities of the world. It brings the name of (IN)VISIBLE CITIES. 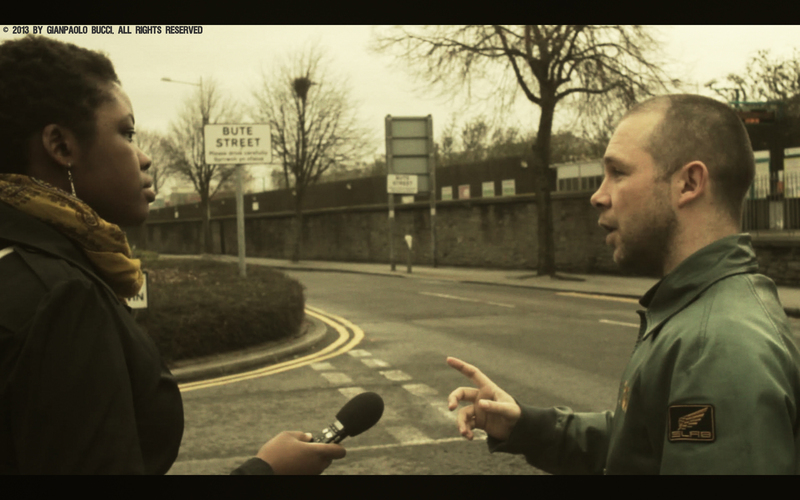 Among those cities, Cardiff was the first stop and Butetown the main focus. Butetown and me have always been acquaintances maybe because nobody properly introduced to each other. Our relationship status updated in March 2013 when the first episode of (IN)VISIBLE CITIES was shot and when I befriended with people who have lived in the area sometimes for their whole lives. It was a long chain of people introducing us to other people that made everything possible. Never the “everyone knows everyone” expression was more adequate. Although Butetown might appear as a closed space, confined between a railway and the Taff river, it is a “town” where doors are literally always open. This works for historic institutions like the Butetown History and Arts Centre as well as for private houses. So shows the way Himmat welcomed us. Himmat came to Butetown few years back after living in other areas of Cardiff and in Denmark. He’s originally from Sudan, but loves the idea of his two little girls growing up in an environment where children gather in the yard and don’t even notice whether they’re from Yemen or Somalia or Malta. Race was never an issue for the Borge’s either, an eleven-people-family whose ethnical roots can be traced back to Malta, France, Somalia, India … just to name a few. So it’s entrenched their love for Butetown that one of the daughters, sitting in the loud and crowded kitchen a stone away from the Bay touristic restaurants, proudly told me she’ll never leave, because that’s her “hometown”. Very few people told us about government benefits, how they have struggled to get where they are or crime, but those who did have diverse opinions on these issues. Some mentioned about how Butetown is considered or is a “tough area”, or has been isolated by the government or the place has been a safe haven for multicultural groups. But mostly we discovered intimate stories and African tradition we did not know about. Like when we first met Maher, a single dad who lives near what was the historic Loudoun square. After recounting his tales of a former sailor coming from Sudan, he let us in his kitchen where we had a taste of Sudanese culture. Maher’s house was filled with a pungent and exotic perfume which he revealed being an incense women use before getting married. Back in the days, his mother might have used that too. He smiled when showing some pictures of his family and parents, especially his mom, who had two long excavation on her cheeks, apparently scarves resulting from a traditional mark made to differentiate tribes. He commented only by saying: “That’s what they do!” Like he wasn’t part of the Sudanese frame anymore. This is something that happens to migrants and second generations: crisis and loss of identity. I experienced it myself when others were asking whether I feel Congolese or Italian. British actress Thandie Newton talked gorgeously about her identity crisis as a girl born from Zimbabwean mother and British father, in a TED Talk. But finding the same paths in people in Butetown just brought me closer and closer. Hassan for example, was the youngest of the people we talked to. Born Somali in Denmark and now a happy resident of Butetown, he confessed he’s a bit confused about his cultural identity and hopes his children will have a clearer vision about this. Hassan is a poet, one of the group that together with producer Gavin Porter, created a two-day show on Somali culture in Butetown. The pièce, De Gabay, took place early in March and introduced to other people living in Cardiff a culture that is now embedded in the history of the capital. I could go on and on talking about people met in Butetown and how they broaden the idea of (IN)VISIBLE CITIES, but it’s better not to spoil the contents of the documentary, that will soon be screened in Seoul in South Korea after being promoted in the U.S.
Not too long ago our chase for African migrants led us to Los Angeles and then continued as we crossed the US from coast to coast. No question we’ll be back in Cardiff to show the documentary as well and catch up with what are now not only protagonists and makers of this adventure, but also friends. Ngalula Beatrice Kabutakapua is an investigative journalist and photographer born in Italy but with Congolese roots. In her seven years spent working in the media she has collaborated with media companies such as The Guardian, L’Espresso, Radio France Internationale and the BBC. Focused on international development, migration and human rights issues, she has also been a staff member of the UN Department of Information and is currently an editorial trainer for the US-based NGO World Pulse. She is an active volunteer and works in Italian, English and French.